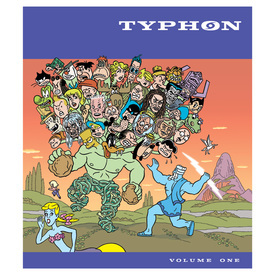 We made a special purchase of this massive comics anthology put together by Danny Hellman as the world economy was imploding in 2008 and was released right as the roof fell in and so recorded less than stellar sales. Now revisit that era with comics by Ken Avidor, Derek Ballard, Gregory Benton, Rupert Bottenberg, DJ Bryant, Mark Campos, David Chelsea, Chris Cilla, Max Clotfelter, Patrick Dean, Bald Eagles, Chance Fiveash, Richard Gagnon, Nicholas Gazin, Robert Goodin, Glenn Head, Danny Hellman, Hugo, Hawk Krall, Tim Lane, Jeff LeBlanc, Pat Moriarty, Cliff Mott, David Paleo, Lorenz Peter, Grant Reynolds, Hans Rickheit, Pshaw, Jim Siergey, R. Sikoryak, Doug Skinner, Fiona Smyth, Steak Mtn., Takeshi Tadatsu, Tobias Tak, Eric Theriault, Matthew Thurber, Motohiko Tokuta, Rich Tommaso, Rick Trembles, Henriette Valium, Dalton Webb, & Chris Wright. Whew! That's quite an ensemble. Full-color cover and full-color interior! NOW ON SALE FOR 60% OFF!